Come enjoy a day at Mission Bay Park in San Diego, the largest aquatic playground in the world, with 4600 acres of fun. Located next to Mission Beach in the heart of San Diego, this is one of the major attractions in San Diego. 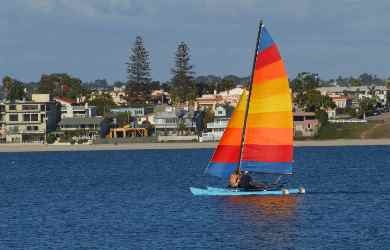 Mission Bay Park has miles of walkways, beaches and water to enjoy, the hub of many water sports in San Diego. You can rent anything from sailboats, motorboats, pedal boats, water skis, canoes, jet skis and kayaks. 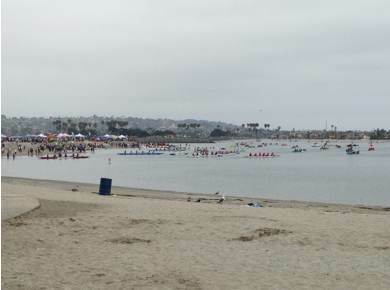 I hate to say it, but if you were not there at the Mission Bay Outrigger Iron Champs Race, you sure missed a good time. Just ask this little guy. He was there! 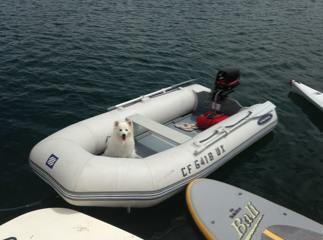 You can rent anything from sailboats, motorboats, pedal boats, water skis, canoes, jet skis and kayaks. We like to rent kayaks and paddle around the bay, or take a leisurely bike ride around the flat paths, which are surprising uncrowded on weekdays. Try Mission Bay Sport Center for rentals or lessons, at 1010 Santa Clara Place, Mission Bay Park (858) 488-1004. 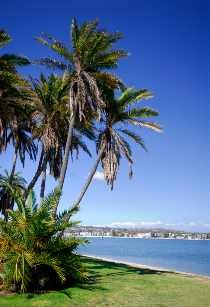 Mission Bay has so much to offer year round. Check it out. Husbands and wives, kids and pets. The shore is always busy with barbeques, crocket, kites, frisbees and the likes of good family outings. While the weather is beautiful, the water is warm and the sunsets are postcard perfect you should gather up your beach attire and head on over. There are a number of coves for swimming in Mission Bay Park San Diego, with calm water and sandy beaches, surrounded by green grassy areas and playgrounds, making Mission Bay Park a great place for small children. 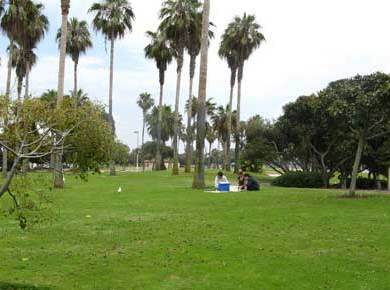 For a romantic San Diego activity, pack a picnic lunch and find a private grassy spot to enjoy a leisurely lunch. Check out the restaurants along the Mission Beach boardwalk for something to eat, or for an inexpensive but tasty best Mexican food San Diego, try the original Rubio’s Baja grill at the northeast end of the park at 4504 E. Mission Bay Drive (858) 272-2801. If you’ve never had fish tacos, definitely give them a try. Whale watching in San Diego is popular from mid-December to mid-March, and you can book a boat excursion to see them close up as they make their annual migration between the Bering Sea and Baja California. Parking: Multiple free parking lots, but arrive early on popular weekends and holidays. Things to Do: Walking, jogging, roller blading, sunbathing, sailing, swimming, kayaking, bicycling and more! Nearby Attractions: Sea World is located in the park. Nearby is Belmont Park San Diego is also conveniently located right along Mission Beach and an easy walk from Mission Bay Park. Sea World San Diego is one of the major attractions in San Diego, located in Mission Bay Park. Sea World is a marine theme park famous for Shamu the killer whale. We have season tickets to San Diego Sea World , and enjoy the variety they offer, for example the summer Cirque de la Mer circus show. 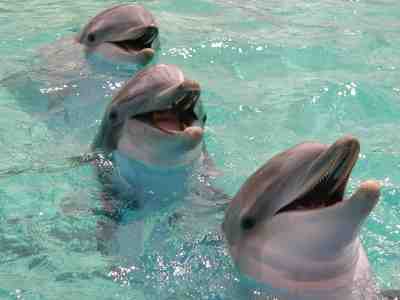 For an adventuresome San Diego outdoor activity, bring your swimsuit and swim with the dolphins at Sea World San Diego Dolphin Interaction. This costs extra and reservations are recommended. My daughter loved it! Seaworld also has overnight Adventure Camps. Directions to Sea World San Diego: From Interstate 5 take the Seaworld Drive exit. Head west one mile. Bring your dog to Fiesta Island to run around unleashed in the sand or in the calm waters of Mission Bay. The north end is nicer. If you have a horse, this is also a great place to ride your horse on the beach. This is open 24 hours, but after 10 PM you can only enter or exit through a walking gate. From Interstate 5 in San Diego, take the Grand Avenue exit or Sea World Drive exit and explore the park. On summer weekends, arrive early to find parking. You can park in the free public parking lots on Mission Blvd. at the north and south side of Belmont Park in South Mission Beach San Diego, or at the end of West Mission Bay Drive.